Licensed Practical Nurse leaders of all types, planners, strategists, evaluators and budgeters, are eyeing the call for nominations to the Council of the College of Licensed Practical Nurses of Alberta (CLPNA). 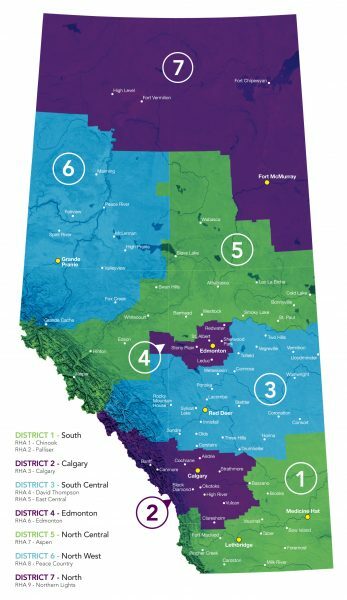 Three large areas are up for election surrounding the major centres of Lethbridge, Medicine Hat, Red Deer, Jasper, Slave Lake, and Cold Lake. LPNs considering throwing their hat into the ring must live in the election district. In the south, a tremendous thank you is extended to Richelle Cash, LPN, the representative for District 1 for completing two terms of service. This District will not have an incumbent running. District 3 and 5 may have their current single-term representatives run again. A June election will decide. Nomination Forms must be submitted by May 31. Eligible LPNs must hold an Active CLPNA Practice Permit and live in the Election District. To discover your District, use the “Find My Election District” document to look up your town or city of residence. Council’s role is to regulate the profession and oversee the CLPNA’s management, actions, and policy development within the framework of the Health Professions Act. They meet quarterly with occasional additional meetings or teleconferences. The three-year terms begin September. The CLPNA’s primary responsibility is regulating the LPN profession, setting and maintaining standards to ensure the public receives safe, competent, and ethical healthcare services. The CLPNA is governed by a Council, which consists of members of the profession (elected by peers) and three government-appointed public members. Questions? Contact Executive Assistant Marjorie Malenfant at mmalenfant@clpna.com, 780-484-8886 or 1-800-661-5877 (toll free in Alberta).